I'd reviewed Blue Oak Valley's Lilly Range (Personal Care) and Baby Kingdom (Baby Care) awhile ago. This time is the Blue Oak Valley - Felicity Skin Care range. 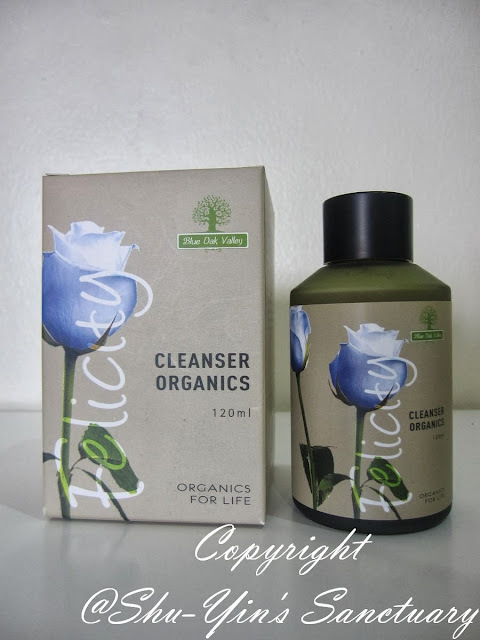 Like what I'd mentioned on both of the reviews, Blue Oak Valley is a Malaysian company that specialises in organic, cruelty-free and natural products. Entirely plant-based, it is eco-friendly and aims to reduce the use of packing material, source-sustainable ingredients and recycle waste. You can read about BOV's commitment and philosophy again here and here. It is not often that I'll agree to review a skin care range. Let me tell you why. If you know me personally, you would notice that I don't have good skin. I have all the skin problems one can get. I have got a very pimply face as a teenager, all the way throughout high school, and into my early adult life. It was not the usual few zits most teenagers have, but a full blown pimply face. Yes, it was that bad. And it was not that I didn't cleanse my face. I did. Several times a day. But still my face was still very oily that one piece of facial blotter couldn't blot all the oil in my face away. I'd need several pieces. True story. So I used many commercial skin care products you find in Guardian or Watson. The thing I looked for then was "For Oily Face". I used many brands but I was still a pimply girl. And as I got older, my pimples became less (though I now have lots of pimple scars). People told me because my hormones were then not raging anymore! But no one told me that my skin profile would change from oily to less oily, and dry. And so I continued to use products meant for oily skin, like what I'd used for the last decade! So what happened? When I realized this, it is rather too late. I was in my late twenties, and now at 31yo, I have very dry and dehydrated skin! So sad. And as I age, not only I have pimple scars, freckles seemed to be freckling out (especially after my trip to Cape Town 2 yrs ago!). And so, my face is all so bad now. I tried using a few different brands of skincare products to try to keep and maintain a healthier skin skin now. It is kinda working, but all the while I chose those skincare products that are not natural, because I thought for my bad skin, I would need some chemically proven products for them to do some "magic" to it. That is until I tried BOV's Felicity Skin Care Range. They came in a brown kraft box with the BOV sticker at the centre of the box. The boxes are also made of recycled material I believe. 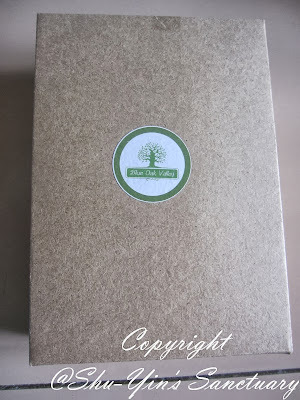 The individual boxes are sturdy and the designs very pleasant with clear, bold wordings of the product. When opened, I was pleased to find that they came in classy glass bottles, which shows the quality of the products. Some came in a pump bottle, and some screw caps. However, the bad thing when it comes to glass bottles is that they are not travel-friendly. I cannot imagine bringing glass bottles when I travel. They are after all the normal big-sized bottles meant for home use, and not meant for travel use. I hope they come in travel size plastic bottles as well. 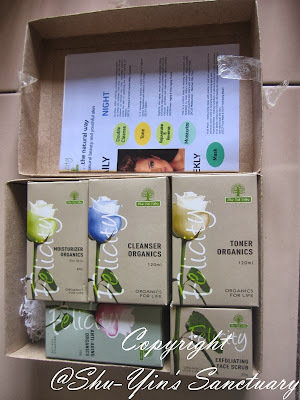 On this Felicity Range, I will first talk about the Daily Face Care, namely the Cleanser, Toner and Moisturizer on this post. The others will be reviewed in subsequent posts. Ok, I admit, I am a noob when it comes to reviewing facial skin care products, but I will try my best to express myself, and how I feel when using it. Like I mentioned, I never paid much attention to natural and organic products, because I thought that my face needed a much "stronger" dose to fix my problems. But the use of harmful ingredients such as petrochemicals, parabens, and sulfates in skincare products has pushed me to start reading labels. If possible, I would try to move away from products with chemicals, and choose to go more organic and natural. And so I gave BOV's Felicity range a try. I have very dry skin, and so their cleanser really does its job to remove surface and inner impurities without drying out my skin. I hate cleansers which makes my skin so dry that I can't even smile without feeling the tightness of it. Although I don't wear much make up, I also uses it to double cleanse every night to remove my sunscreen and bb cream that I apply during the day. Works well. What I love about it is that I just need to pour a really small amount of cleanser onto my palm, and it lathers really well. So a bottle of 120ml goes a really long way. I've been using it for about 3 months now and I haven't finished using the whole bottle yet. It is made of pure and fine botanical extracts micture, and you can expect this cleanser fragrance to smell something like that. It has a herbal smell to it, but please don't equate the herbal smell to those stinky chinese medicine smell. 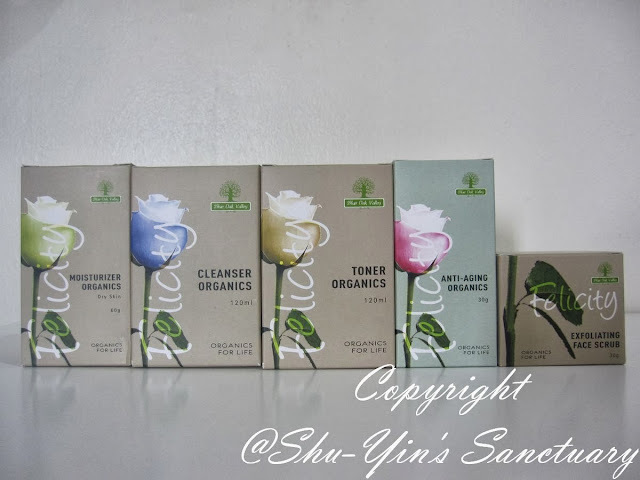 It is actually a refreshing herbal smell which smells really pleasant yet organic. Need some time to get used to by some, but totally hit my spot. I love the smell of my cleanser. Aqua, quince extract* aloe barbadensis*, lactic acid, grapefruit seed extract, glycerin* glyceryl cocoate, pelargonium roseum wild*, rosa damascena*, citrus aurantium*, cimbopogon martini* (*CERTIFIED ORGANIC). I used to think a toner's function is to further cleanse the dirt off. Sigh, told you I'm a noob. Anyway, now I know that a toner's function doesn't serve to cleanse, it is actually to tone and prep, and balance our skin. It normalizes surface oils for the skin to prep it for the next few steps. It avtually feels like water. I call it the holy water. It kinda purifies my face. I find the toner really gentle. I said so because when I used it over a pimple my itchy hands pricked, it doesn't sting at all. I think it also kinda helped in the healing of that pimple too. 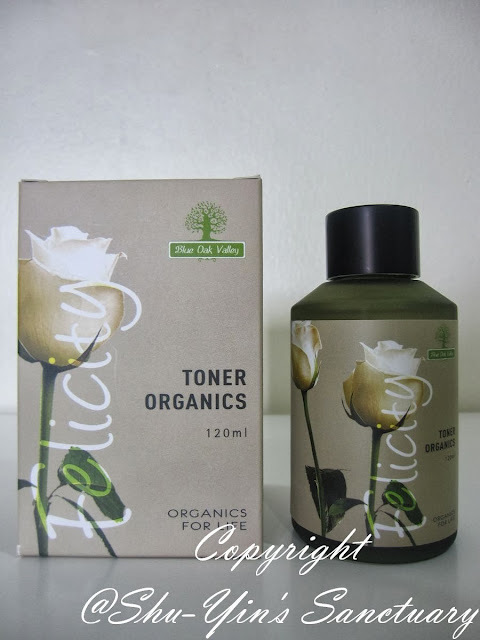 This pour-on facial toner is suitable for all skin types. I had no problem using it with my dry skin condition. This alcohol-free formula of exotic herbs not only hydrates and soothes my skin, but it also protects and tightens pores. How's that sound? In terms of fragrance, I think it has a mild and pleasant flowery smell which remind me of jasmine, though I don't see this flower being listed in the ingredient list. I wonder where that smell comes from? I'm kinda hooked to the smell. I have dry and dehydrated skin so I know I need a really good moisturizer that moisturizes well but yet not too greasy. One pump should be sufficient to spread my entire face, therefore this product goes a long way too. Initially, however when spreading it all over my face, I'd had a hard time for my skin to absorb it well. I needed to really massage it into my face for it to be absorbed well, if not it would be white all over my face. However, after discussing it with the BOV people, I was advised that as time goes by, with more frequent scrubs, it would remove the trapped oil from clogged pores. And after that, the moisturizer absorbs into my skin easily. So yeah, it was my problem, and not the problem of the product. lol. This moisturizer comes in a classy pump bottle as well. It has a raw, non-fragrant kinda smell. It smells almost similar to BOV's Body Lotion Organics from the Lilly range. 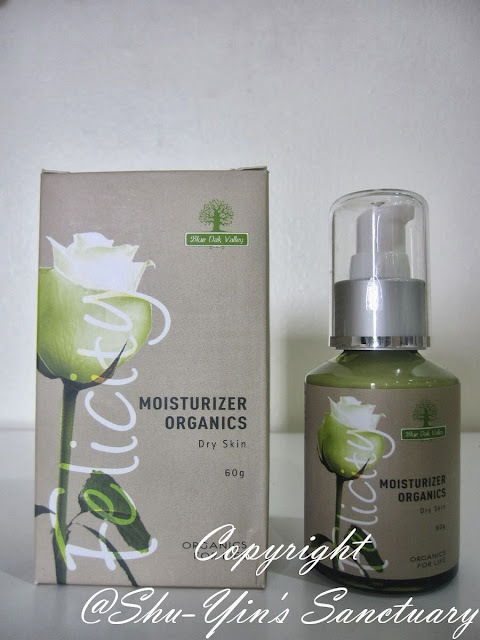 It is a very nourishing moisturizer which leaves my skin moisturized the whole day through. After application, my face feels soft and nurtured. And most important of all, it feels non-greasy. I hate greasy moisturizers which I feel like I poured oil onto my face. Stay tuned for Part 2, 3 and 4 reviews with Giveaways as well! - and after that will be 15% off STOREWIDE for a further 6 months (until 30 Jun 2014) using discount code 'SHUYIN15'. - Only applicable for online sales. If you wish to see and hold (and smell!) the products before you make a purchase, BOV products are also available in stores. And here is the link to the list of retailers. And special mention to the retailer Fabulous Mom which has nationwide stores, and Twins Baby as there is a Twins Baby store in Penang located in Jln Masjid Negeri (somewhere opposite Convent Green Lane). So for you Penang readers, you can drop by there! For more info, you can also visit Blue Oak Valley website or their Facebook page. 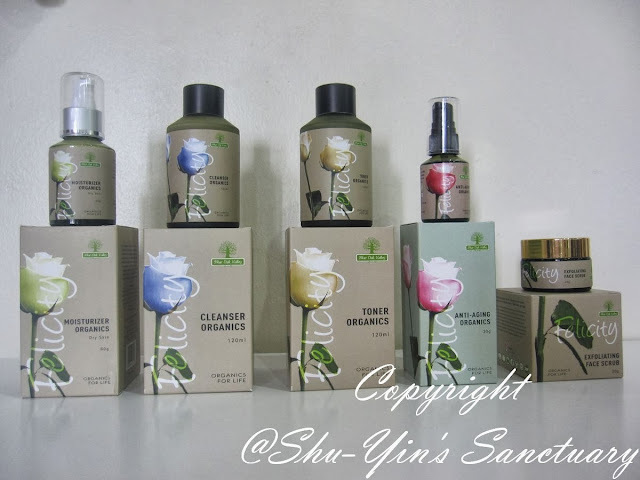 * Disclosure: I received the Cleanser Organics (120ml), Tone Organics (120ml), Moisturizer Organics (60g) for review purpose, but no monetary incentive was received. All text and opinions are of my own and represents my honest opinion of the product(s). The Day Khye's Fever Reached 39.9 Degree Celcius!